3 cable AV？. 1 mode d'emploi？. Couleur: argent？. 3 Adaptateur secteur. 2 récepteur？. 5.8GHz Wireless AV Sender. · 5.8GHz frequency band - no interference from wireless networks or wireless CCTV. This system uses the 5.8GHz band with four switch able frequencies within the range, this is to avoid interference from cordless phones and other wireless devices and to provide greater range. 3 cable AV？. Couleur: argent？. 3 Adaptateur secteur. 2 récepteur？. Contenu du colis:？. 3 cable AV？. 3 Adaptateur secteur. 2 récepteur？. Contenu du colis:？. Though Bluetooth transmission mode, send audio sources like TV, CD player, MP3 to Bluetooth speakers or Bluetooth headsets. Function: 2-in-1 Transmitter Receiver. Support Bluetooth Protocol: Support a2dp/avctp/avdtp/avrcp/hfp/spp/smp/att/gap/gatt/rfcomm/sdp/12cap profile. H-366T Bluetooth 4.0 A2DP Audio Stereo Dongle Adapter Transmitter for TV PC MP3 DVD. One cable connects the H-366T Bluetooth Transmitter to the headphone socket of your TV, Hi-Fi, Car Stereo etc. To connect, simply turn the power on the H-366T Bluetooth Transmitter and connect via Bluetooth to your Bluetooth headphones or speakers. PAT-635 as “The Digital Wireless AV Transmitter Receiver” is a kind of eletronic product. It consists of a transmitter and a receiver. Digital TV Set Top Box or any other A/V device at transmitter end to TV sets in different room at receiver end. Model Number: TX6. Support automatic search to connect Bluetooth devices to achieve wireless audio transmission. Bluetooth Version: Bluetooth 4.2. Smart compatibility, for Android, for iOS system phones and PAD, and all Bluetooth audio devices. Connect the wireless module (receiver) to your car monitor - yellow plug for AV input. Connect the wireless module (transmitter) to the reverse light of your car to get the power - red wire for positive and black wire for negative. 3W Wireless Video Transmitter Receiver Monitor Wireless Long Distance TX RX. - Receiver x 1. - Input impedence: 75ohm. - Input level: 1VP-P. - Audio Video connecting cable x 2. - Video format: NTSC/PAL. [HDMI SIGNAL SUPPORTED]: Transmitter support 1 group HDMI signal inpout and 1 group HDMI output signal, Recevier support 1 group HDMI signal output. Wireless transmitter distance in obstructive place such as living rooms that are walled off by 0-1 walls. Car Recorder/HD Car DVR. PowerOf Transmitter /Receiver : 3W. With extended frequency function, multiple frequencies can be extended to up to 8 using frequency. Suitable for AV output devices such as DVD, DVR and IPTV, etc. • 2-in-1 feature, Bluetooth Receiver 4.1, Bluetooth Transmitter 2.1, low power, smart compatible, Android, IOS system phone and PAD, and all Bluetooth audio devices. • Bluetooth reception: speakers, headphones, etc. Smartphone & Accessories. • 2-in-1 feature, Bluetooth Receiver 4.1, Bluetooth Transmitter 2.1, low power, smart compatible, Android, IOS system phone and PAD, and all Bluetooth audio devices. • Bluetooth reception: speakers, headphones, etc. The product consists of a transmitter and a receiver. 1 x Transmitter. 2.4GHz module is FCC CLASSB certificated. Use 2.4 GHz ISM frequency band, multiple selective channels supported for anti-interference from wireless. Transceiver distance:330 feet (using transmit power 100nv in open. Transmit power: 1-100mv(default is 100nV when ordering). Three input modes:1. Stereo audio input2.Normal microphone input3.Monitor pickup audio input. ). 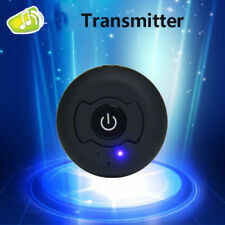 Global 2.4GHz Wireless Speaker Transmitter Receiver. Other Features Transmitter Transmitter box built-in 320mAh lithium battery (Receiver box doesn't have built-in battery );. 1 x Wireless audio receiver ;. Allows you to receive signals wherever you are in the house. Transmission distance: Up to 300m/ 984ft. 1-for-all function enables 1 transmitter to work with several receivers to maximize the range of signal, thus letting you receiving signals wherever you are in the house. The HDMI signal source (such as DVR and NVR hard disk recorder) is connected to the transmitter of the HDMI extension. The HDMI extension is specially designed for monitoring, suitable for DVR, NVR hard disk recorders and so on. Work as a BT Transmitter: Connect any MP3, CD, DVD, TV’s …… audio out (Line-out) to this Bluetooth Transmitter. Power-on your Bluetooth Headphone or Speaker Box. This Bluetooth Transmitter will automatically Pair and Connect with your Bluetooth Headphone or Speaker. Note: The receiver and the transmitter must be connected to the antenna before power. PowerOf Transmitter /Receiver : 3W. 2 x AV Connection Cable. 1 x Transmitter. With extended frequency function, multiple frequencies can be extended to up to 8 using frequency. wireless HDMI video sender” is a kind of eletronic product, which can realize the audio video signal sharing in different rooms for family entertainment. It consists of a HDMI transmitter and a HDMI receiver. Adopting advanced 5.8 GHz wireless transmission schemes and having advantages of long distance transmission, strong anti-interference and high mobility. By means of radio waves, it can transmit the signal from HD Payer, DVD, Set Top Box, PS3, HDCP, PC or any other HDMI jack devices at transmitter end to TV sets in different room at receiver end. Moreover, it can support the IR remote control at the receiver end to realize the function of wireless control of devices from another place. So that you can enjoy freely wireless HD AV sharing data and Hi-Fi audio and video effect. Input Interface: Three Input Modes: 1. Stereo Audio Input, 2. Ordinary Microphone Input, 3. Monitor Pickup Input. Module Actual Working Channel: 20CH. Included: 1 x Transmitter. Input level: Max 1.0 Vpk. 1 2 in 1 Bluetooth Audio Transmitter & Receiver. • Bluetooth: V2.1. 1 3.5mm Audio Cable. • Audio Port: 3.5mm. 1 AV Cable. 1 USB Charging Cable. • Color: Black. • Charging: Micro USB 5V/0.5A. Available channels: 4CH. 1 Wireless Transmitter. 1 Connecting Line for Transmitter. 1 AV cable. 1 Wireless Receiver. Light and small. Output Power: 3W. Switch between transmitter and receiver modes with the simple flick of a switch. Effortlessly connect using advanced Bluetooth technology and 3.5mm audio cable (included). Receiver mode: wirelessly streams audio from your Bluetooth-enabled phone, tablet, or computer to your wired stereo, speakers, or headphones.